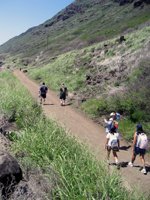 Kaena Point (West Shore) is a Flat, but Fun and Scenic Hawaii Hike. The Western Half of Oahu's Final Frontier! 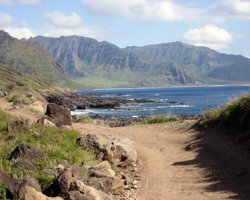 Basically, the Kaena Point coastal hike (west shore route) is a 2.4-mile walk from the end of the road to the end of the island. This is a horizontal hike – meaning it is nice and level – along what used to be the old railroad route. This remote corner of the island is the last piece of Oahu coastline that has no paved roads. So from Mokuleia on Oahu’s North Shore to Yokohama Beach on the Waianae (West) Coast, there is nothing but dirt trails. Four-wheel-drive vehicles can cover only part of this distance from either direction, but it is impossible to drive the entire coastline. 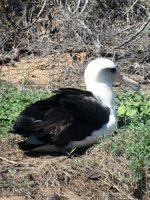 Because Kaena Point is a nesting area for shearwaters, pets are forbidden (except service animals); and it’s important that you stay on the marked path. The hundreds of holes in the ground on both sides of the path are all shearwater nests. 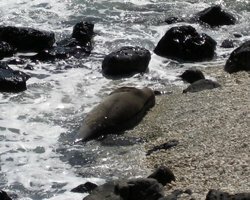 In addition to birds, you can hope to see whales (usually in winter), dolphins, turtles, and/or Hawaiian monk seals – all of which are fairly common sights in this area. 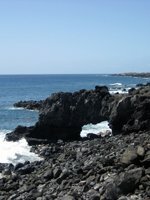 Kaena Point can also be reached by hiking the north shore route. To get to the trailhead (western route) take the H1 Freeway going west until the freeway ends and becomes Farrington Highway west. Then just stay on Farrington Highway until the paved road literally ends. Then you’re there. 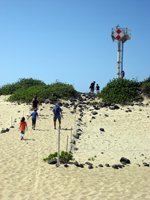 Kaena Point is one of the hottest and driest areas on Oahu, so make sure you use plenty of sunscreen and bring enough water for everybody. Along the route, there are dozens of beautiful little inlets and tide pools. Feel free to stop at any of them you can safely get to and splash around for a while or explore the tide pools. There is a “blowhole” where wave action pushes water through a lava tunnel to shoot up out of the rocks (if the waves are right). You’ll probably hear it before you see it. There are two rock arches; and the water is as blue as you can imagine. At the Point, there is a bird sanctuary and a small lighthouse (next to an older, collapsed lighthouse). There is also a nice little beach where you can cool off. My whole family did this hike, with several other families, on a stormy day in late March. Well, the weather report said it was going to be a bad storm; but fortunately, the weather report is often wrong about storms, and the weather was gorgeous! Along the way, we saw what we think was five different whales plus two Hawaiian Monk Seals. Because this hike is flat, we covered the distance at a leisurely, group-of-families pace in approximately 50 minutes each direction. (When I was in my 20’s, I used to do it in about half of that time). My wife and seven-year-old son were the most exhausted by this hike, yet they both said it was fine – not too hard. I, personally, would call the Kaena Point coastal hike (west) one of the easiest hikes in Hawaii, simply because you don’t have to hike straight up and down the face of a mountain like so many other Hawaii hikes. Nevertheless, it's a little long and a lot thirsty. One last piece of information that might influence your decision… the view of the west shore and Waianae Valley is spectacular (photo at top)! On a beautiful sunny day, only a few other Oahu sights can compare. Disclaimer: Stupidity and carelessness can kill you. Use your brain and take responsibility for your own safety. Know the limits of your ability and stay within them. Watch your kids like a hawk. Heed posted warning signs. Stay on the marked trails. Never turn your back to the waves. Bring lots of water and snacks. Use your sunscreen. Live to enjoy another Hawaii vacation day!